This description of the Book of Haggai is from Easton's Bible Dictionary. 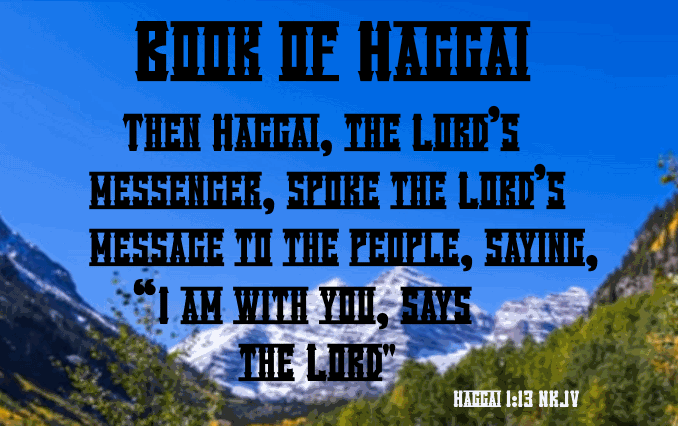 Haggai, Book of: consists of two brief, comprehensive chapters. The object of the prophet was generally to urge the people to proceed with the rebuilding of the temple. The second prophecy (Haggai 2:1-9), which was delivered a month after the first. The fourth prophecy (Haggai 2:20-23), delivered on the same day as the third. These discourses are referred to in Ezra 5:1; 6:14; Hebrews 12:26 (Comp. Haggai 2:7,8,22).